The other day I discovered that there is in fact another book of Spanish manga published by Hobby Consolas. And we have scans of the entire thing this time! 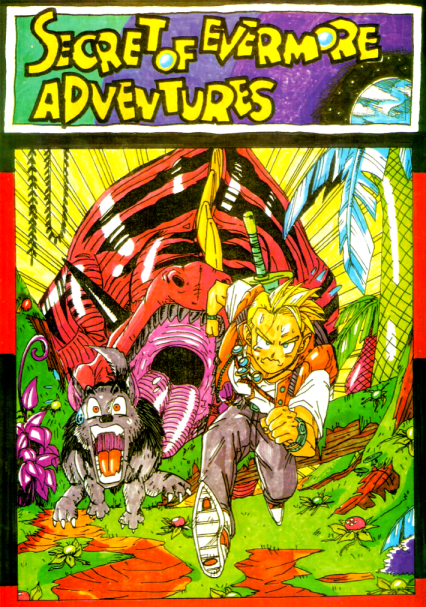 After flipping through it I was astounded to find a mock-Toriyama Secret of Evermore comic! I instantly demanded this become a priority job for Opentrain and now I can share it with you all. This file has the longest filename thus far for us, so here it is in all it’s glory: Mangas & Videogames 1st National Competition – Secret of Evermore Adventures [Opentrain].cbr! Of course we will be doing more of this book. It’s at least as insane as the other one we’ve worked on from this magazine, so you know we’re all about this. It’s been an interesting week or so behind the scenes for Opentrain, and it’s looking like we’ll have at least a couple more releases coming up actually soon this time around! One Response to Yes. Tiny likes irony. Ooh! Very exciting! New releases from you guys are always worth checking out. This one didn’t disappoint in the weirdness department, although it was very short. Good to see this underrated gem get some comic love as well. As for the tease, I hope this means there’s more Club Nintendo coming up! It’s my favourite of your projects (except maybe Novas Aventuras but that’s finished now).